New Brunswick/Newark, N.J. – A new partnership between Rutgers Cancer Institute of New Jersey and University Hospital in Newark is resulting in the expansion of National Cancer Institute (NCI)-designated Comprehensive Cancer Center services to the greater Essex region. The multidisciplinary service line at the cancer center at the Newark hospital now includes care provided by Rutgers Cancer Institute medical oncologists, which augments radiation oncology services that have been provided by Rutgers Cancer Institute for the past seven years and surgical oncology services provided by Rutgers faculty members. An infrastructure to bring additional cancer clinical trials to patients in the region is also part of the new partnership, as is the expansion of community outreach, education and screening programs. 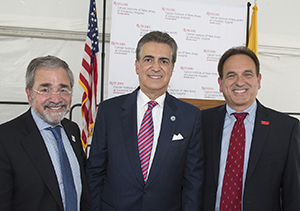 The new entity, known as Rutgers Cancer Institute of New Jersey at University Hospital, was celebrated today at the Newark facility at an event which included Governor Chris Christie and other government officials along with University Hospital President and CEO John N. Kastanis, MBA, FACHE; Rutgers University President Robert Barchi, MD, PhD; and Rutgers Biomedical and Health Sciences Chancellor Brian Strom, MD, MPH. “Enhancing the access to care to cancer patients in the Essex County area is a major achievement. Bringing these services to Newark through this partnership with University Hospital reflects an understanding of the need for the types of care the Rutgers Cancer Institute of New Jersey can provide as one of the leading cancer centers in the country,” notes Dr. Strom. 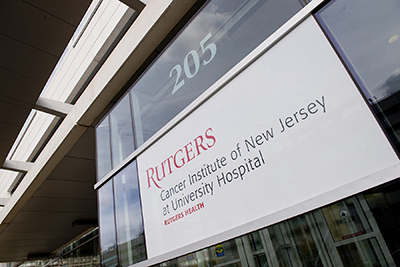 “As the state’s only NCI-Comprehensive Cancer Center, Rutgers Cancer Institute of New Jersey has a mission to provide patients with advanced care, including clinical trials, some of which are only available at NCI-designated centers. This new partnership with University Hospital will expand access to these novel cancer therapies bringing the latest treatments to all populations in the greater Newark area,” notes Susan Goodin, PharmD, the newly named interim director of Rutgers Cancer Institute of New Jersey at University Hospital and professor of medicine at Rutgers Robert Wood Johnson Medical School. Along with clinical trials that study innovative new therapies and diagnostic methods that are not widely available, care options will include precision medicine approaches that are based on targeting genetic characteristics of cancer and utilizing drug compounds that "block" cancer-inducing pathways, adds Dr. Goodin. Additionally, the new partnership will result in increased screening, treatment and education with a special focus on underserved populations. The aim is to work with community partners in the greater Newark area to identify cancer-related needs and develop community-based participatory education, training, and research among racial/ethnic minorities and underserved populations. These activities will form the basis for future cancer-focused outreach initiatives, which will include creating culturally-sensitive educational materials and improving cancer literacy and communication between patients and healthcare providers.